I have tomorrow off and plan to start the day in a leisurely fashion, perhaps by having some pancakes or waffles for breakfast, so it is a good excuse to try making a somewhat strange recipe from the 1898 New Galt Cook Book. The recipe for Made Syrup for Pancakes was contributed by Mrs. John Goldie. I decided to try the version mentioned at the end of the recipe as I thought I too might prefer the syrup made with Orleans sugar. I was pretty sure that meant using brown sugar although I’ve only heard the term Orleans applied to molasses just like Porto Rico which appears in the ad from The Canadian Grocer. 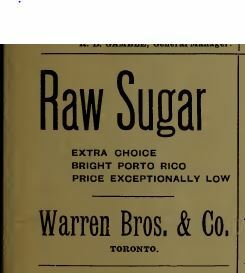 Sugar advertisement in The Canadian Grocer magazine June 1898. I thought it would give more depth of flavour to this homemade pancake syrup. I didn’t want to end up with a huge amount so I cut the quantity quite significantly. I weighed 1/2 pound (8 ounces) of brown sugar and put it in a saucepan and added 1/3 cup of water. I stirred and turned the heat on low to let the sugar dissolve. I turned the heat up a bit more and stirred to make sure it was well mixed. Once it was hot but before it boiled I removed the pan from the heat. Time to taste! 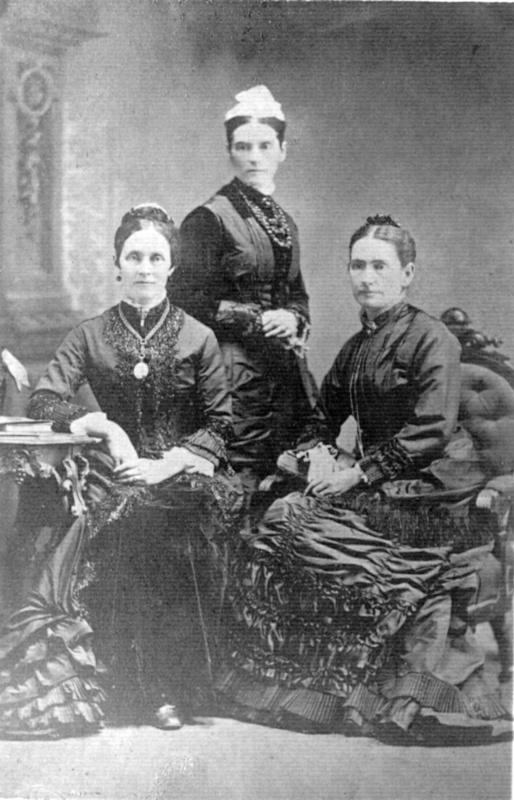 Margaret with her older sisters Janet and Charlotte. Mrs. John Goldie is Margaret Rogers, the daughter of Rebecca and Alexander a farming couple. She was born locally in 1838 and married John Goldie in 1870. They had a son and daughter and also took in a relative’s children. Her daughter Ella contributed recipes too and so did her sister-in-law. Her husband John was the founder of Goldie & McCulloch an important manufacturing business in Galt. By 1898 this family would be very comfortable so I find it surprising that Mrs. Goldie is sharing such a simple and probably cost cutting recipe. She was in her early 80s when she died in 1920. This is a basic syrup and although I’m just tasting it alone I think it will be good on pancakes. I do think the brown sugar is an advantage and makes it more interesting. Keep this recipe around if you run out of your usual syrup. The pursuit and richest syrup is made by dissolving sugar in the proportion of three pounds of sugar to one pint of water. Many persons prefer the flavor of syrup made of Orleans sugar to that made of the white.